384 pages, January 2010, Spokesman Books, Nottingham. 45 Tables and Charts, over 650 references. £18 for single copy, £15 each for two or more copies. eBook format, price £11.99. “Whitfield outlines how Western countries slashed their spending on infrastructure, thus creating an “infrastructure crisis.” Neoliberal governments then looked to private investment to solve the crisis through public-private partnerships. “Infrastructure spending,” says Whitfield, “didn’t just fall, it was a result of public and fiscal decisions on taxation, user fees, and spending priorities.” Most important, the book describes how P3s undermine democracy – Keith Reynolds, CCPA Research Associate. The Guardian Public Online: 10 December 2009, Profiteering from public private partnerships. A lack of transparency and disclosure has led to a secondary market in investment funds for PPP projects, with some operated from offshore tax havens. Does profiteering from the sale of equity make a mockery of democratic control and more importantly erode public service values? Village Magazine (Politics, News & Culture), Ireland, December 2009 – January 2010, page 26: The PPP Mistake: Public sector alternatives to the infrastructure market and Public Private Partnerships in Ireland, the US and worldwide (not yet available online). Truthout – independent news & political analysis, Friday 15 January 2010, Op-Ed, Global Auction of Public Assets. A Change in the Role of Government, Dexter Whitfield assesses the role of Infrastructure UK and the proposed Green Investment Bank, Chartist, May/June 2010. 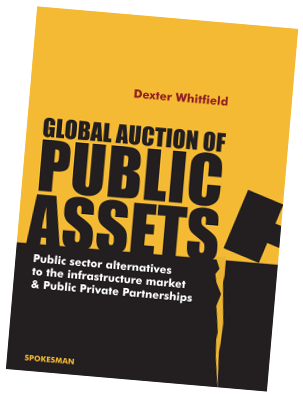 Press Release on Publication of Global Auction of Public Assets. Published on 21st October 2009. Last updated 22nd November 2018.